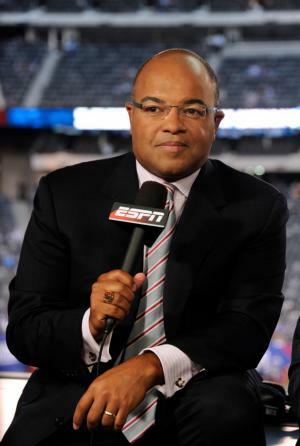 Michael Todd Tirico was born on 13 December 1966, in Queens, New York City, USA. He is sportscaster, probably best known for his role as a play-by-play announcer on ESPN’s “Monday Night Football” coverage. A famous sportscaster, how rich is Mike Tirico? Sources state that Tirico’s net worth reaches $3 million, as of mid-2016. His wealth has mostly been accumulated during his career on ESPN TV and radio. Tirico attended Bayside High School and later enrolled in New York’s Syracuse University. During his undergraduate years, he worked as Sports Director at WTVH-TV in Syracuse, a CBS affiliate, and as play-by-play voice for Syracuse University basketball, football, lacrosse and volleyball and for the Super Sports Network of Cook CableVision. In 1991 he joined ESPN as the anchor of the sports news television program SportsCenter, handling various assignments, including covering college basketball games from 1997 to 2002. Another included handling play-by-play for ESPN’s Thursday night college football package, from 1997 to 2005, while hosting which since 2002, Tirico has worked with famous television personalities such as Hubie Brown, Greg Anthony and Tom Tolbert. He also hosted the ESPN/ABC PGA Golf Coverage from 1997 to 2015, and studio coverage of a number of ESPN/ABC events, such as “Monday Night Countdown” from 1993 to 2001, as well as NBA studio shows. He also hosted the debut of ESPNEWS in 1996. All these projects have enabled Tirico to establish himself as a recognized figure in ESPN’s multimedia platforms, as well as in the industry at large, and have greatly added to his net worth. In 2006 Tirico became play-by-play commentator of ESPN’s “Monday Night Football”, alongside analyst Jon Gruden, one of the longest-running ever to appear on commercial network television, and one of the highest-rated ones too. More than any other project done by Tirico, “Monday Night Football” has contributed to the commentator’s popularity as well as to his wealth. Tirico has also broadcast NBA games on ESPN/ABC, and served as the anchor of the 2009 US Open tennis tournament. In 2012 he returned to ESPN’s college basketball coverage, serving as play-by-play voice for weekly Super Tuesday Big Ten games. He also hosted ESPN’s coverage of the 2010 and 2014 FIFA World Cup soccer events and, more recently, the UEFA Euro 2016. Aside from his television work, Tirico has also worked as a radio host; carrying on from his college days, he later hosted “The Mike Tirico Show”, a nationally syndicated sports news and discussion program on ESPN Radio from 2007 to 2009. He also hosted ESPN Radio’s “Monday Night Preview” podcast, and handled radio play-by-play for the 2010 Rose Bowl, the 2010-14 BCS Championship games and the College Football Playoff National Championship in 2015 and 2016. Additionally, Tirico has frequently done play-by-play for the NBA Finals on ESPN Radio. Every fall he hosts the radio’s football program and podcast called “Weekend Blitz”. In mid-2016 Tirico joined NBC Sports and is expected to become the play-by-play anchor of the network’s “Thursday Night Football” coverage beginning with the 2016 NFL season. During his career, Tirico has received a number of awards and honors, such as being named the 2010 Sportscaster of the Year by NSSA, being nominated for a Sports Emmy in the Outstanding Personality – Play-by-Play category, and being given the 2011 Harrah’s Sports Broadcaster of the Year Award from the Maxwell Football Club. When it comes to his personal life, Tirico has been married to Deborah Gibaratz Tirico since 1997, and the couple has two children, residing in Ann Arbor, Michigan. The sportscaster has been involved in a controversy during his time on ESPN. Reportedly, in 1992 he was suspended by the network for a number of incidents that included attempted groping, sexual solicitation and stalking of female colleagues. The books “Those Guys Have All the Fun” by James Andrew Miller and Tom Shales and “The Uncensored History” by Michael Freeman offer a deeper insight into these statements. 1  Inducted into the hall of fame of Syracuse University's radio station WAER. 2 Graduated from Syracuse University in 1988 with a bachelor of arts degree in political science and broadcast journalism.